I’m willing to bet almost none of you are familiar with a horse named Bamboo Harvester. Yet he’s probably one of the most famous horses in U.S. history. Bamboo Harvester was born in 1949 and was bred to be a show horse. For the first 11 years of his life, he was just that, traveling across the country gathering championships. Bamboo Harvester was also a representative of the Palomino Horse Association, headed by Jim and Edna Fagan, and his sire, The Harvester, was a prime example of the PHA’s registry standards. Both The Harvester and Bamboo Harvester were entered in the Pasadena Rose Parade on many occasions. In 1960, the horse was sold to Mr. and Mrs. Carl Wood, who also campaigned him, before they sold him on to Les Hilton. Still a stallion at the time, he was gelded after Hilton purchased him. Hilton began to train him as soon as he recovered in preparation for filming. Hilton was pretty famous himself; he was one of the elite movie horse trainers of his time and a former apprentice of Will Rogers. So if anyone could increase Bamboo Harvester’s star it was Hilton. He was patient, methodical and incorporated voice commands and body movements that excited the horse into the action he was trying to teach them. As soon as he received the response he wanted, even just a little bit, he’d reward the horse. Once the horse became more confident in the command, he would transition from words to physical cues. Hilton also used whips but never to strike the horse. The whip was an extension of his hand to direct which way the horse should look or move. Specific movements of Hilton’s whip or body meant different things to the horses. For example, a whip lifted high meant to rear or a whip held to the left might have meant for the horse to look left. In order for a movie horse to be successful, the trainer must train him thoroughly, making sure the cues are subtle, yet visible enough that the trainer can remain off camera. 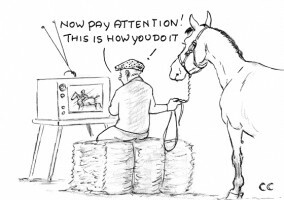 The horses have to be totally focused on the trainer, and the trainer has to be flexible enough to work from any angle, depending on the actions the horse needs to perform. Of course, ropes and halters have to be optional. Bamboo Harvester was destined to be an on screen horse. His charming personality placed him at the forefront of daily life in Hilton’s barn, where he was stabled next to his stunt double, Pumpkin. Visitors couldn’t even greet Bamboo’s stable mate before him, or the horse would pout and slam the top of his Dutch door shut. He always wanted to be first, whether it was with new tricks or toys, or mundane things like feeding time or stall mucking. When fans came to visit, Hilton was always careful to introduce Bamboo first, or he wouldn’t perform. Pumpkin was eight years younger than Bamboo and seemed happy to remain an understudy. Pumpkin appeared uninterested in the workmanlike manner Bamboo brought to training and film shoots and was more inclined to playing than working. Pumpkin, an American Quarter Horse, and Bamboo had drastically different personalities as well as coat colors and markings. Pumpkin was more of a golden palomino, while Bamboo carried the silvery coat color. Pumpkin also had a distinct golden pumpkin in the middle of his white blaze, which was covered with white paint for filming and photo shoots. Bamboo, however, solidified his fame as Mister Ed. Of course, the million-dollar question has always been: How did Hilton train him to talk? The method was kept secret for decades, and while many people were convinced that Hilton put peanut butter on Bamboo’s lips, that wasn’t the case. Hilton taught Bamboo to move his lips on cue, much like he trained him to perform his other tricks. However, Bamboo liked the movement so much that he wouldn’t stop “talking” on cue unless Hilton walked away. Since this wasn’t an ideal method, Hilton had to think of another way. If you watch the show, you’ll notice that Bamboo always wore a halter on camera, and if you look closely enough, you might notice a very small line running from the halter off camera. This line was connected to each side of his halter and ran under his upper lip. When Hilton wanted him to talk he would wiggle the line. The line was hard to see, but attentive fans did notice it on occasion. Mister Ed’s voice belonged to Allan “Rocky” Lane, who was a popular film cowboy during the late 1940s and early 1950s. He was a little embarrassed to play the part of a horse, so he wasn’t listed in the credits. Mister Ed was billed as “Himself,” which helped boost the idea that he really did speak. Bamboo and Hilton had many other tricks, including hitting a baseball and riding a surfboard, and Bamboo learned each new trick with enthusiasm. Pumpkin also learned all the tricks in preparation for eventually taking over for Bamboo, but he only ended up in the series once. Another advantage to Bamboo’s personality was that he was unaffected by the chaos typically surrounding a movie set. He could focus despite the noisy atmosphere and often only needed one take to get the needed shot. Pumpkin, being much younger, wasn’t quite so sure about the crew working around him, and he often became worried, but as he grew older, he became much steadier. Mister Ed first aired on Jan. 5, 1961, and ran for six seasons and 143 episodes. The final episode ran on Feb. 6, 1966. There are conflicting stories surrounding the circumstances of Bamboo Harvester’s death, one of which is that the horse suffered several different health problems and was euthanized in 1970 and buried at Snodgrass Farm in Oklahoma. However, Alan Young, who played Wilbur Post in the show, wrote in his book Mister Ed And Me that he would often visit Bamboo during his retirement and states that he died after being administered a tranquilizer by a temporary caregiver at Hilton’s farm in Burbank, Calif. Since Bamboo was a heavier horse, it’s theorized that he was struggling to get up after lying down and the caregiver thought the horse was distressed, which prompted him to give him the drug. Supposedly, Hilton cremated and scattered Bamboo’s remains in an unknown location. A different horse died in Oklahoma in 1979 that was believed to be Bamboo Harvester, but in reality it was a horse that had posed for photos for press kits. After the real Bamboo’s death in 1970, the stand-in was unofficially called Mister Ed. Regardless of how he died, Bamboo Harvester’s legacy lies in his contribution to American pop culture. He won PATSY (Performing Animal Top Stars Of The Year) awards, given by the American Humane Association, every year from 1962 to 1965 and helped the American public fully appreciate the talents of all television and movie animal actors. One of web writer Coree Reuter’s favorite parts of working at The Chronicle of the Horse is adventuring up into the attic. While it’s occasionally a journey that requires a head lamp, GPS unit and dust mask, nearly 75 years of the equine industry is documented in the old issues and photographs that live above the offices, and Coree is determined to unearth the great stories of the past. Inspired by the saying: “History was written on the back of a horse,” she hopes to demystify the legends, find new ones and honor the horses who have changed the scope of everyday life with this blog. Curious about anything in particular? Have a question or an interesting topic? Please e-mail Coree, she’d love to hear from you!